Check out a feature film of the property and and an interactive 3-D walking tour at www.757internationalisle.info Experience the charm of the French countryside in the heart of Colorado at the exquisite "Chateau d Etoile - Bringing old-world elegance and modern amenities to elevate your luxury lifestyle! Intentional design, care & custom craftsmanship is evident at every turn. Light fills this open and airy floor plan to accentuate the soaring ceilings, exposed architectural beams and stunning mountain & garden views from every room! The second story apartment suite provides privacy & all the amenities you could want for guests, family or staff. Full home audio system allows you to set the mood for interior and exterior spaces while the numerous patios, extensive wine cellar, gourmet kitchen, large bar/game room, home theater, manicured gardens and Villa-style courtyard make this home an entertainer's paradise. 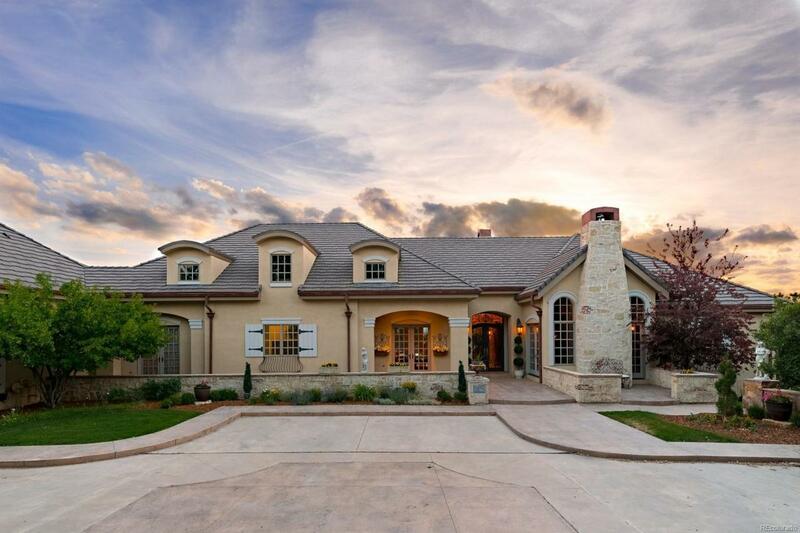 Offered by Mile High Luxury Real Estate. Association Name Primary Castle Pines Homes Association Inc.